Many a time I’m asked this question, “What do you have in breakfast” or “What do Bengalis have in breakfast?” I never faced this kind of questions before coming to Hyderabad, which has polar opposite taste preference than us/Bengalis. After giving it a fair amount of thought I have come up with the answer and I can tell you… THE ANSWER IS NOT SMALL. Being a Bengali, I don’t claim to eat authentic bengali food from dawn to dusk, my breakfast menu is hugely influenced by different parts of India. It depends upon many other factors like- who’s preparing it (because my cooking skill is questionable! ), how much time we have for preparing and having breakfast, some special occasion and so on. Considering the varieties of dishes I’m going to tell you about, the answer is more accurate for “What Indians eat in breakfast?” So here are some dishes Indians have in breakfast (there will be many more regional breakfasts that I don’t know of, so consider this as a small part of the list). I’m dividing the list in 3 sections. The 1st section lists the breakfast I usually have at home. The 2nd section is the breakfasts I started after moving to South India. The 3rd section is some quick easy o make or ready made breakfast that suit a busy lifestyle. You can get an idea about what Indian breakfast is like from this. ‘Ruti‘ is nothing but round Indian bread made from flour and ‘sobji‘ is vegetable. It can be stir-fried veggies or a simple curry. This is a simple everyday breakfast at our home. Ruti tastes the best when it’s just taken off the tawa(where it is made). As a picky eater I have always been very particular about what veggies I would like to have with the bread. If I’m not a matter of concern, mom will grab any random vegetable that is available at home and make a fry/curry. It’s a low-fat, fulfilling breakfast. Some people like to have it in dinner. Making roti calls for some skills and time that I don’t have! So this breakfast is an option only when I’m at home. This is a little fancier that the 1st one. Luchi is basically a deep-fried flat bread. Luchi tastes best with potato curry (Alu’r Dom), slow-cooked spicy meat or yellow pea cooked with gravy. This is one of the popular snacks in Bengal. You will get the same dish in other parts of India as well but the flavors and size, consistency of the bread will differ. At my home luchi is prepared on special occasions like at the time of puja or when relatives come to visit us. Usually I like to avoid fried stuffs in breakfast but it is fine for once in a while. Paratha is also made from flour, you can think it as a cousin of the 1st two. There are several varieties of it depending on the stuffing(mashed potato, lentils, onions, raddish, cabbage etc), kneading and folding. This is one of the popular breakfast/evening snack in India. Lack of time and skill makes it impossible for me to have parathas as breakfast on an usual busy day. Kochuri is usually a round flattened ball made of flour filled with a stuffing of moong dal or Urad Dal (crushed and washed horse beans), besan (crushed and washed gram flour), black pepper, red chili powder, salt and other spices. There are different variations of it in different states of India. A fancy breakfast, certainly not for everyday! This one is tasty and healthy. Poha is equally popular as an evening snack in India. All you need some are some flattened rice, spice and veggies of your choice. What a blissful source of carbohydrate it is! Let’s see what my stay at South India has contributed to my breakfast menu! Dosa looks similar to crepe. Its main ingredients are rice and black gram. Among the several varieties of dosa, plain dosa(also known as paper dosa) and masala dosa (spicy mashed potato inside it) are the most popular ones. It is eaten with sambar and coconut-ground nut chutney. Dosa has gained popularity outside south India(its origin) as well. It’s so light and simple that no one can get sick of dosa! It’s a close relative of dosa. It’s like a thick pancake with toppings. I would have called it the south Indian adaptation of pizza but that would be too underwhelming. Imagine a pizza without cheese, without pizza sause, without the crispy greasy crust. You can have the same accompaniments as dosa with uttapam. Just another harmless light breakfast from South India. It’s a rice cake which is prepared by steaming a batter consisting of fermented black lentils and rice. People have it with sambar. This is one of the things I started eating after moving to south. Honestly I cannot differentiate this two from the taste or look. Basically it tastes like sour yellow rice. Feel free to add a comment if you can tell the difference. 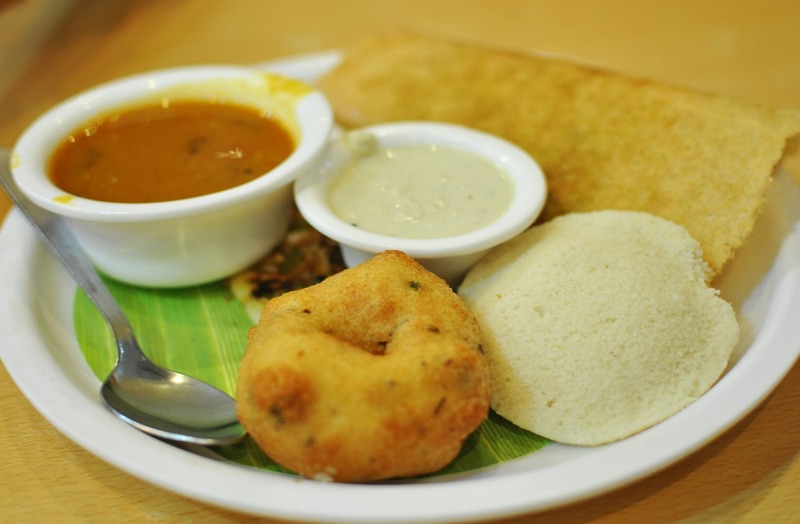 Another popular breakfast originating from south India. Upma is like a thick porridge prepared with dry-roasted semolina (rava/suji), any cooking oil, some mustard, cumin seeds and choice of veggies(optional). This is one of my favourites because of its quick and simple preparation. Usually I don’t prefer spicy/oily/heavy meal at the beginning of my day. Pongal is a made from rice and moong dal. It’s mildly spicy or sweet and perfect for breakfast. My south Indian friends will be so happy to hear that this is one of the things that I’m going take back home while leaving Hyderabad. The vada/wada is a savoury fried snack. It looks like a deep fried donut. Another deep fried snack mostly popular in South India. It has sweet and savory variations. Punugulu is a snack popular in Andhra Pradesh. A thick batter of rice, urad dal and spices is deep fried in the size of tiny cheese balls. All of the above dishes are both healthy and tasty but I don’t find any of them easy and quick enough to make on regular basis. The breakfasts I usually opt for requires least time and skill even though taste wise it cannot face the above ones. A bowl of cereals in a bowl of cold milk- yes that’s the kind of breakfast I can think of on a usual day. Sometimes I do level it up with some dry fruits or freshly cut fruits. There are a lot health drinks available in the market that Indian parents religiously make their children drink every single day. I don’t know any kid who has never been forced to drink milk or such drinks in their childhood. Even though I am kind of skeptical about the nutritious value of those health drinks, I always have one of those at my home. Sometimes I make myself a cup of Horlicks and grab some biscuits. It would be a nightmare for my parents to think of starting a day without a cup of chai. This is like an essential part of the breakfast for many people here. Personally I am not a big fan of tea or coffee. I drink tea/coffee only when I’m getting too cold or feeling sleepy. Shout out to the morning tea for keeping me awake in the early morning lectures after the sleepless nights. I grew up eating the Indian version (or rather I should say ‘Bengali’) version of pancake. After having American style pancakes for the time, I liked it more. I tried making it from scratch and from pancake mix. I found it super easy and delicious so I included it in my breakfast menu as well. This is also a popular “easy” breakfast/snack. Sometimes I make it sweet, sometimes savory. For the savory one, my mom uses milk bread or sweet bread and she adds some Indian spices in the egg. Boy oh boy! I can’t tell you how good it tastes! This is popular among the broke college students (been there, done that!) who are compelled to stay in hostel. Instant noodles has a whole fan base for being cheap and extremely easy to make. Instant pasta is not as cheap and popular as instant noodles but it’s one of the easiest thing to make for breakfast/evening snack. Oats are not loved here. People absolutely hate it just like any other healthy food. Nonetheless people have oats to get their body in shape. I absolutely love it as a breakfast. Some fresh bread and cucumbers, tomatoes and that’s it. People who are always busy and don’t want to weigh themselves down with a heavy breakfast love this. This is a popular breakfast for the busy adults who are still a child inside. If you don’t like bread and butter- we can’t be friends! I tried this in a restaurant and became a fan of it. The only problem to make this at home is that I don’t really find big tub of yogurt in the super markets. I have used curd which is a close alternative of it to make parfait but you can tell the difference. And there are days when we really don’t care to make breakfast and grab anything at random to eat. What do Indians have in breakfast? – hope to excelsior!